Affordability seems to be on the radar of more investors now that some of our major capital city markets are experiencing softer market conditions. The thing is, when most people were still focused on Sydney in 2015, we were already looking at affordable locations that offered serious investment potential. So, while Sydney’s median house price was hitting an eye-watering $1 million, we were actively investing in much more affordable areas with promises of future capital growth upswing. One of those locations was Geelong in regional Victoria, which has median house prices significantly lower than Melbourne while only being one hour’s commute away from Australia’s second biggest city. Back then, the only time most people seemed to talk about Geelong was in conversations about the closure of its Ford manufacturing plant, which was not fair given the strength of its overall economic profile. Most people thought those job losses would correspondingly mean a big hit to its property market and economy generally, but we always believed that its employment sector would evolve rather than evaporate. That was courtesy of new government jobs and major infrastructure projects such as the Geelong rail duplication and the proposed fast rail between Geelong and Melbourne as part of the Melbourne Airport Link as well as urban growth strategies to potentially cater for 100,000 new residents in the years ahead. 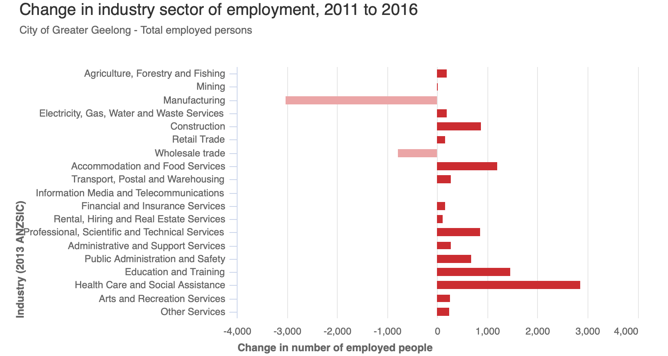 In fact, according to the Australian Bureau of Statistics (ABS), while about 3,000 jobs were lost in manufacturing between 2011 and 2016, the same number of jobs were correspondingly created in health care. In fact, more than new 10,000 jobs were created in the same period in industries other than manufacturing, including about 1,500 in education alone. So, even though the closure of the Ford plant was a blow for workers, it didn’t have the expected negative impact on the region overall. In fact, Geelong’s population has been growing at a stronger rate than Melbourne’s over the past three years with annual increases of between 2.5 and three per cent. Its population is now sitting just below 250,000 and is expected to keep growing at a healthy rate every year. 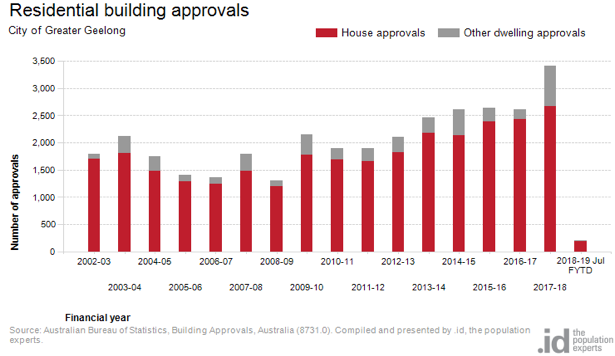 What’s more, while building approvals are on the rise, they are not keeping up with these strong increases in population. According to the ABS, Geelong’s population has actually grown by more than 18,000 people in the past three years alone. Geelong’s affordability compared to Melbourne in particular is no doubt one of the reasons why its market is recording solid price gains. In fact, recent CoreLogic research found that it was the strongest regional performer over the past year when it came to annual housing value growth. The research showed that annual housing growth in Geelong was 11.8 per cent in the 12 months to September this year – a result stronger than its five-year average. The Greater Geelong median house price is now $530,000 but is still very affordable when compared to a median house price of $850,000 in Melbourne and $1.1 million in Sydney. There is no doubt that demand for property in Geelong is soaring with days on market in a suburb like Newcomb, for example, falling dramatically from 74 in 2014 to just 22 days today. Local agents are even reporting that properties are selling after the very first open home. While first home buyers are eyeing Geelong because of its affordable property, investors are also in the mix because of its strong economy and growing population. Geelong might have been previously best known for its AFL team and these days it is also ahead of the competition when it comes to property investment fundamentals and performance.